Uploading Raiser's Edge and Financial Edge backups to Microsoft Azure Storage Explorer enables the Hosting Implementation team to migrate your database. 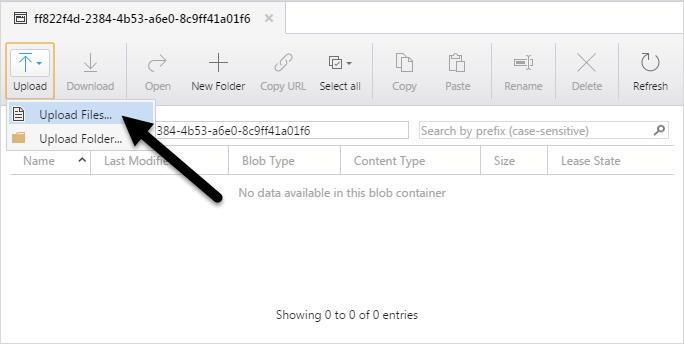 To provide Blackbaud with your backup file for migration, you need to download Microsoft Azure Storage Explorer, create a backup of your Raiser's Edge or Financial Edge database, enter the storage container key provided by your Blackbaud Hosting Implementation Coordinator, and then upload your backup file. We recommend you download Microsoft Azure Storage Explorer on the same database server where you will be creating a backup of your database. If you plan to store your backup on a network location, you can also install Azure Storage Explorer on a server or workstation where you can access your backup file. From the Microsoft Azure Storage Explorer website, download the free tool for macOS, Linux, or Windows. On the database server, open the Blackbaud Management Console. Note: The SQL Server database engine can be left running while the database is being backed up through the Blackbaud Management Console. Under the database name to be backed up, highlight Backup. Do not enter a password. In the Backup path field, enter a location for the backup or click the browse button to locate the directory. Ensure that there are no punctuation marks or symbols in the database backup path. For example, change C:\Raiser's Edge to C:\Raisers Edge. You must save the backup on a local drive, not a network drive. Ensure this path is entered each time, as the system does not automatically retain this information. Mark the Compress files after backup checkbox to zip the files. Click Backup. A waiting screen appears while the database files are backed up and compressed into a single ZIP file. Once complete, the Backup History window will show "Succeeded" as the result. For more information, see How do I make a backup and restore from or test the backup. 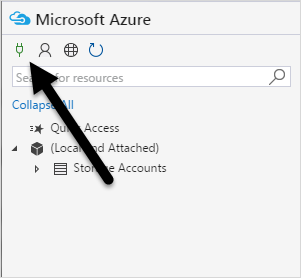 From the Connect to Azure Storage screen, select Connect using your Storage Account information and click Next. 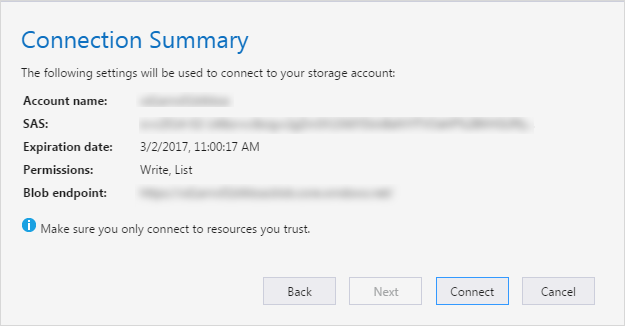 If this screen does not appear, on the main screen under Microsoft Azure, click Connect to Azure storage. For the How do you want to connect to your Storage Account or service? 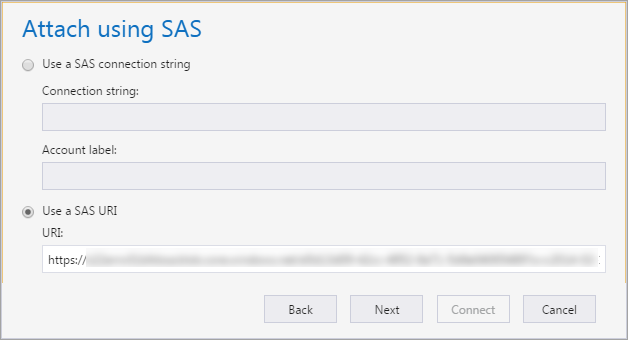 field, select Use a shared access signature (SAS) URI or connection string and then select Next. Click Next. A Connection Summary screen appears. Click Connect. 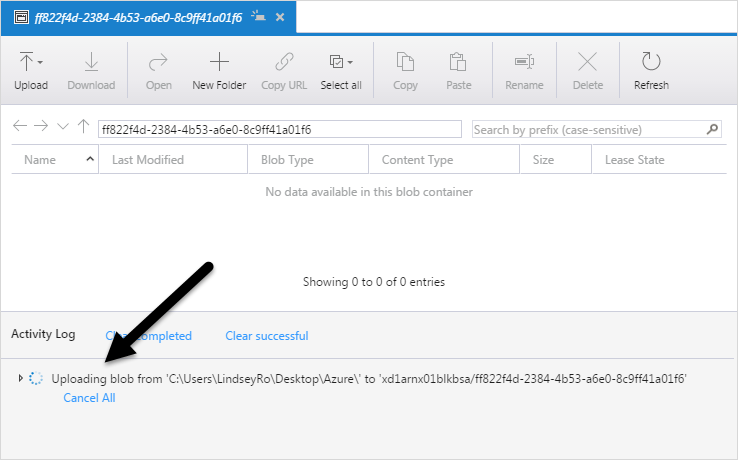 Your Azure storage blob container appears. To send your Raiser's Edge or Financial Edge backup file to Blackbaud, click Upload. On the Upload Files screen, in the Files field, search for and select your backup file. You can upload a .bak or .zip backup file. Do not change any of the other settings on this screen. Click Upload. You can see the progress of your upload in the Activity Log section. Once the file uploads, you can also click Refresh to see the file uploaded into the container. Note: The time it takes to upload your backup file depends on the size of your backup and your network connection speed. If you’re struggling to upload a backup file, we recommend you try to upload a .zip file instead of a .bak. Once your file is uploaded, inform your Hosting Implementation Coordinator. If you uploaded more than one file, tell your coordinator the name of the file to use for your migration. When you upload to Azure Storage Explorer, your files are uploaded to Azure hosting in the same region of the world as the location of your data center. 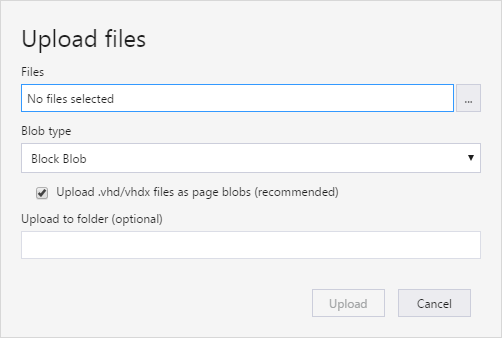 If you need to re-upload a file, rename it locally and then attempt the upload again. 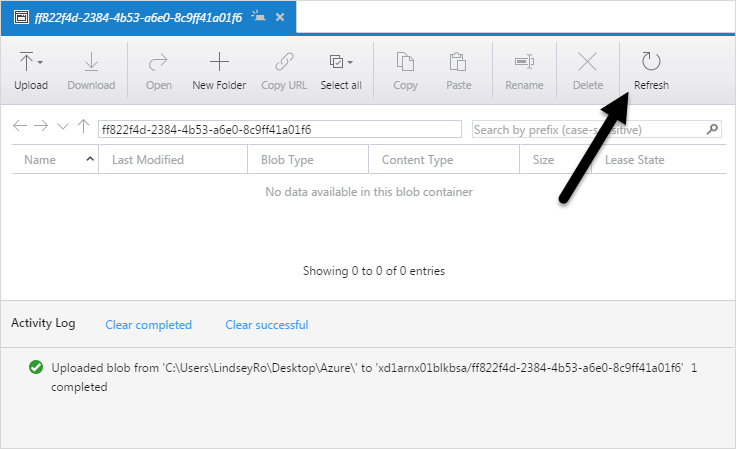 Azure Storage Explorer securely uploads your file by https to secure Azure hosting servers. The file is then used by our software in migrating your database. No person views or modifies your data in our process. We do not recommend you share your storage key. If you take longer than 90 days to upload your backup database, please contact your Blackbaud Hosting Implementation Coordinator to obtain a new storage container key.